This was just one photograph from a weekend in the Hungarian capital Budapest. 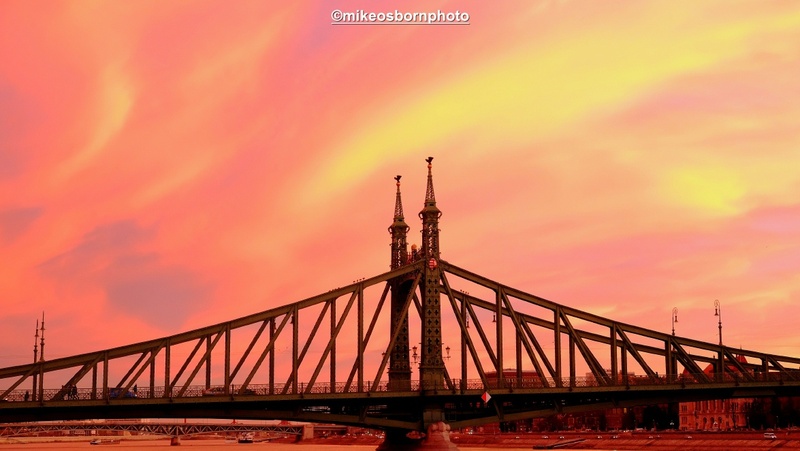 The elegant Freedom Bridge, which spans the Danube, is framed in a glowing pink sunset. It’s a shot that embraces the architecture of a wonderful city, offering so much for the photographer and traveller alike. Well I’ve plenty of those! There are actually too many places and objects to capture in the Hungarian capital. Absolutely. You’ll have a clicking frenzy :) I have to work out where to take my/ourselves off this coming year – always with the camera as precious hand cargo! A beautiful scene Mike. That sky on its own could have made an interesting shot, but this bridge pretty much one-ups it. Great combination. Thank you very much. If you haven’t made it to Budapest yet, I highly recommend it with some of your camera gear in tow. A great city. That would be lovely, I have heard that from other people too. Sounds like a great place to visit.